A-One Insurance Group has started 2018 well as their apprentice Ben Bronsell from the Ringwood Office has just been declared Apprentice of the Year at The South West Business and Community Awards. The ceremony organised by South West Expo and backed by The Business Exchange, was held on 18 January at The Double Tree Hilton Hotel, Swindon. The awards saw the multi-award winner and BBC Dragon’s Den 2017 winner Julianne Ponan deliver an inspirational and motivational speech. 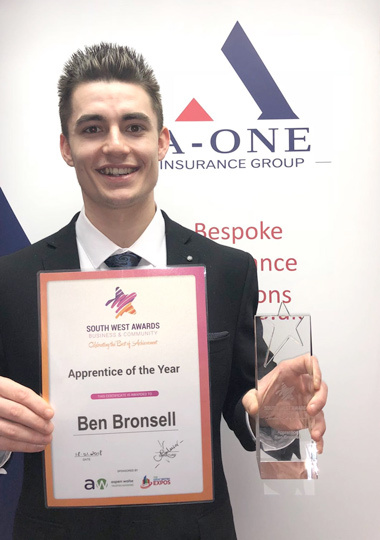 Ian Penfold, founder and managing director, A-One Insurance Group, said, “What an honour for our apprentice Ben Bronsell to be crowned the winner in the South West Region. It is also an honour for the whole team who have mentored and guided him on his business development journey so far”. Ben Bronsell, said of his achievement, “I am immensely proud to have been chosen as the Apprentice of the Year. It was overwhelming and totally unexpected. It’s been a great experience and has helped my communication, presentation and networking skills considerably. “Being interviewed by the judges puts you under immense scrutiny. The judges told me choosing the winner for my category was very tough as all of the entries were of a very high standard. “This recognition is for the whole company and not just for me. It has made me understand that if you work hard, listen and use each opportunity as an experience you can develop, grow and make improvements and I would like to thank A-One for the opportunity their A-One Academy has given me both professionally and personally”.